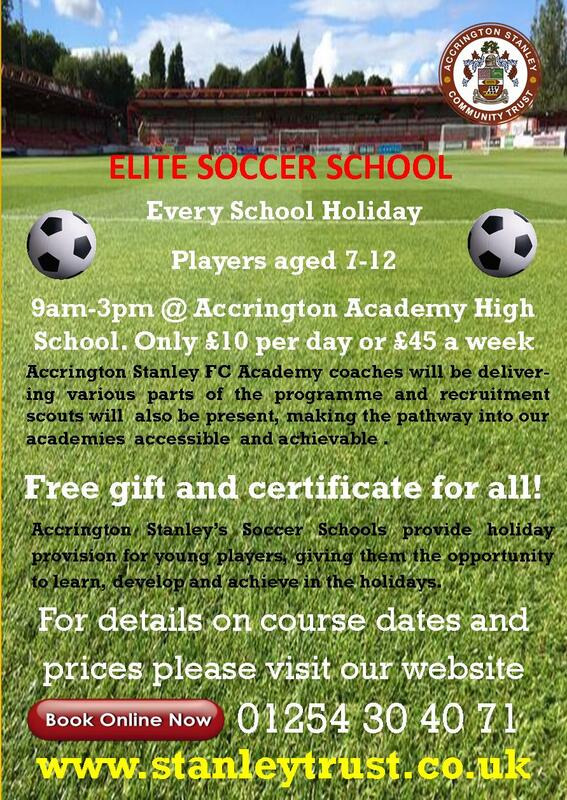 Accrington Stanley Community Trust and the clubs Academy Department are teaming up to offer young footballers a unique opportunity to train with the academy and their coaches! The first Elite Soccer School of 2016 will run during the February half term. Mon 15th Feb-Fri 19th Feb and is open to young footballers aged 7-12 who currently play grass-roots football. 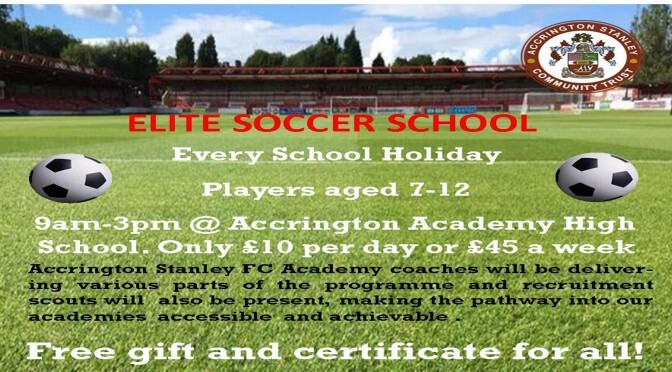 Academy coaches will be delivering five days of sessions aimed at helping youngsters develop all areas of their game and also provide them with the opportunity to show off their skills in front of Accrington Stanley’s recruitment scouts. “You usually have to write in or be scouted in your team to get a trial but these camps with the trust give our academy recruitment scouts a chance to come and see players, it’s also a chance for you to work with our academy coaching staff and train alongside our signed academy players. I do hope you take this unique opportunity and we hope to see you on trial or in an academy team with the club soon” David Bailey Academy Head of Recruitment & Talent ID. The course will be based at Accrington Academy High School on their state of the art 3G pitch and will run from 9am-3pm, children are asked to bring a packed lunch and appropriate clothing for all weather. Places can be booked through the Community Trust website by Clicking here. For more information please contact us on 01254 304071.